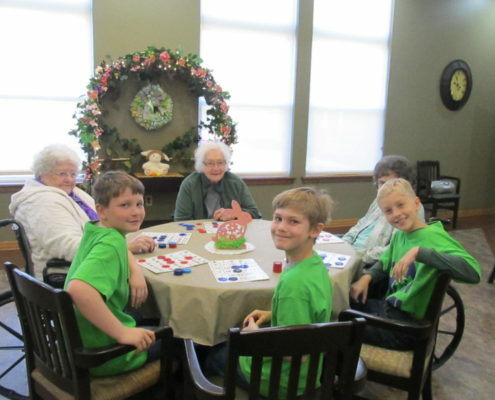 Residents and staff gathered to bid a fond farewell to retiring nurse JoAnne LeMere on May 31st. 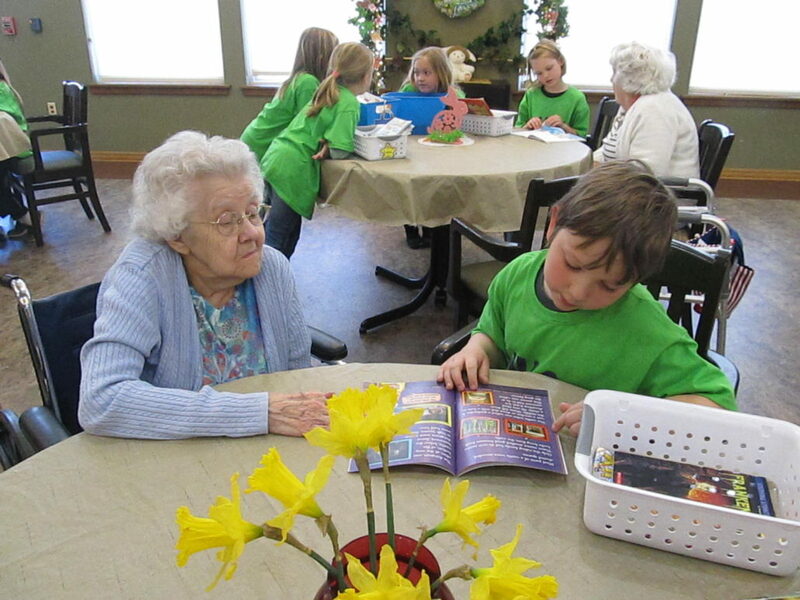 JoAnne began working at the Augusta Area Home 50 years ago as a CNA. Realizing that nursing was a career she loved, she earned her nursing degree and returned to her hometown facility to care for friends, neighbors and relatives. 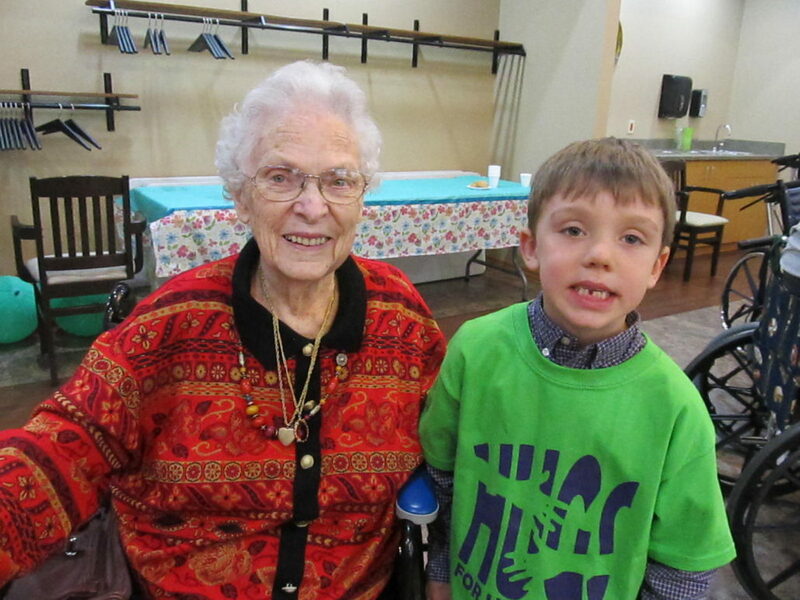 She has a lifetime of caring dedication invested in the facility and will be deeply missed. Thank you for everything you’ve done JoAnne! 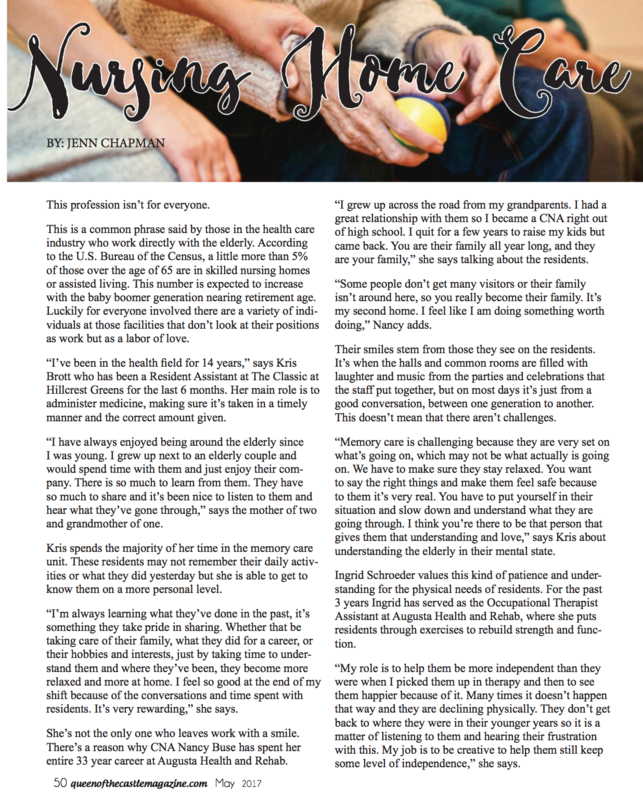 There’s a reason why CNA Nancy Buse has spent her entire 33 year career at Augusta Health and Rehab. “I grew up across the road from my grandparents. I had a great relationship with them so I became a CNA right out of high school. I quit for a few years to raise my kids but came back. 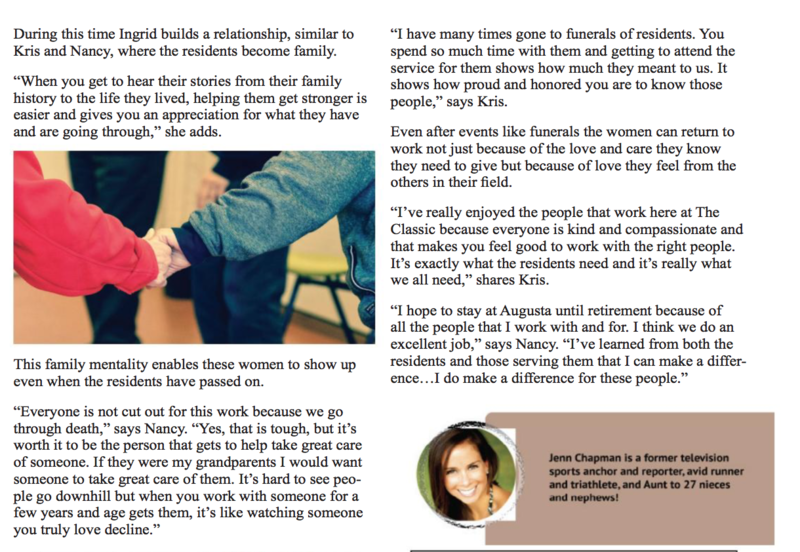 You are their family all year long, and they are your family,” she says talking about the residents. “Some people don’t get many visitors or their family isn’t around here, so you really become their family. It’s my second home. I feel like I am doing something worth doing,” Nancy adds. 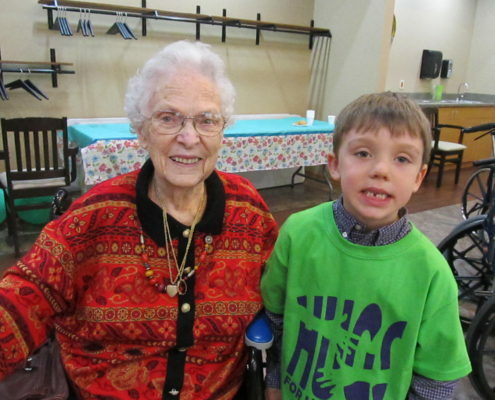 Residents enjoyed two exciting days full of young energy in Observance of “Hugs for Humanity” Days. 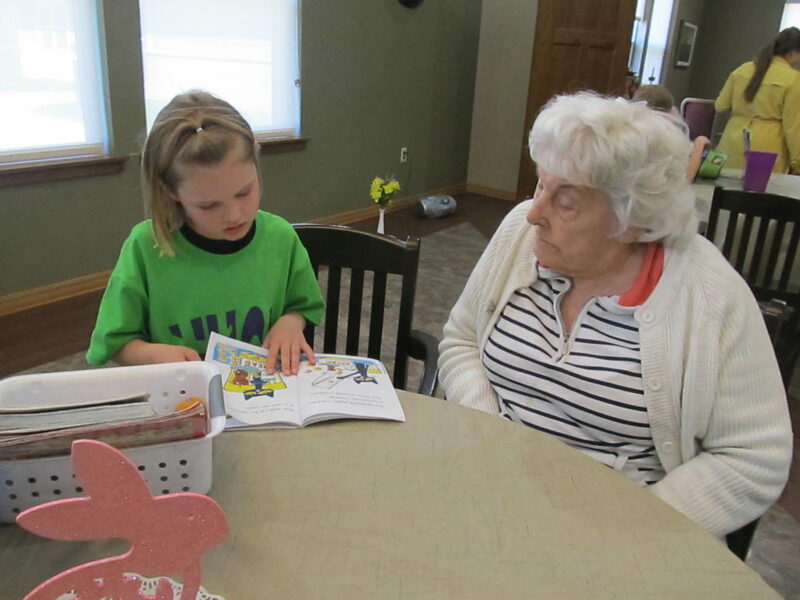 On April 20th the two classes of 4-K children came in the morning and afternoon to sing songs for the residents and enjoy a snack with them. 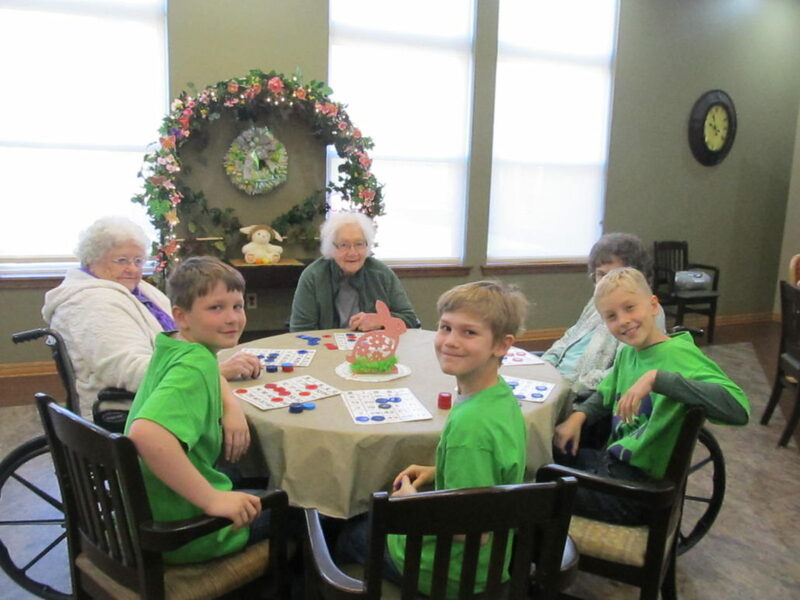 Friday, April 21, the 4th grade students came for Bingo in the morning and paired up to assist residents. Everyone won a prize and the children were all treated to snacks and juice before leaving. 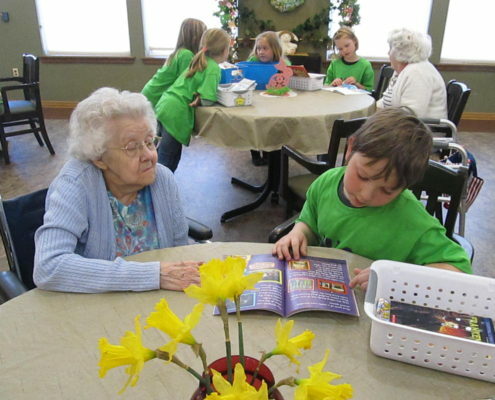 In the afternoon on the Friday the 2nd of May, grade class came to read for the residents. 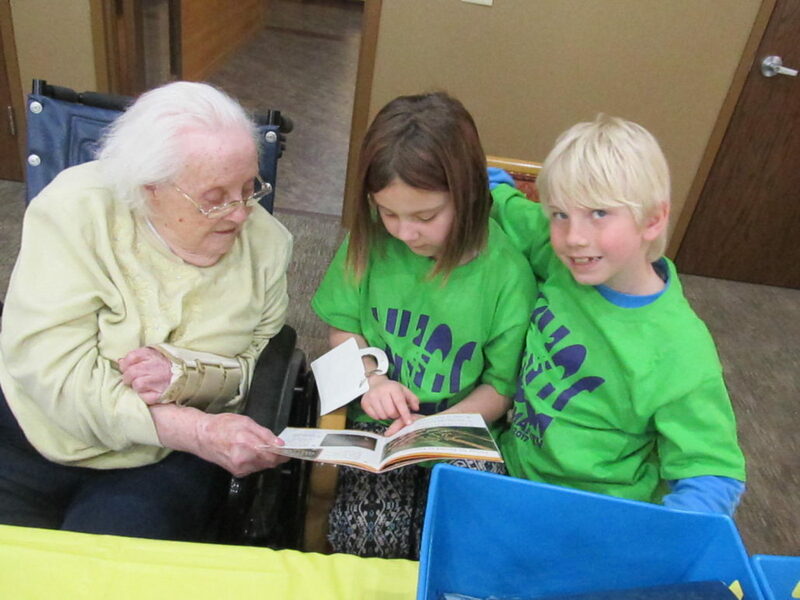 The students took turns reading to the residents at each table. 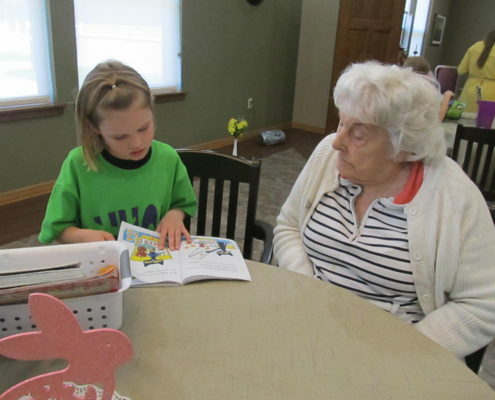 Residents helped if the students got stuck on a word, but the students had all practiced their books and did a marvelous job of reading. Refreshments were served to top off the afternoon. Everyone enjoyed these special days with the children. 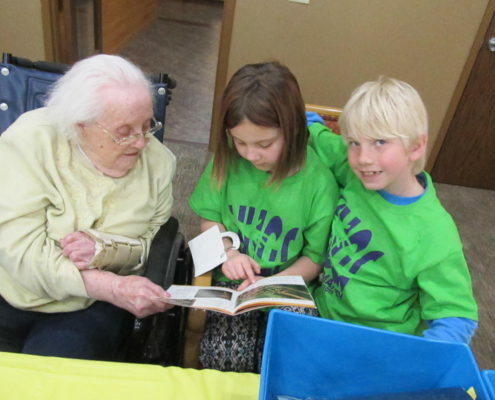 AUGUSTA — Viola Bradley listened intently as Augusta Elementary student Stephanie Bergman read aloud about a lost dog named Sam. Reworking Bergman’s words into a question, the former educator who has been retired for more than 25 years, looked at two other second-grade students listening along. 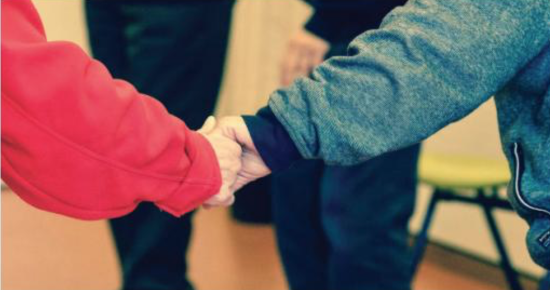 “What fell all over when she bumped into the man?” Bradley, a resident of Augusta Health & Rehabilitation, asked of the students. “Cans,” said Danica Strauss, 8, who was seated next to Bradley. “Good, you were listening,” Bradley said as she grabbed a hold of Strauss’ hand. 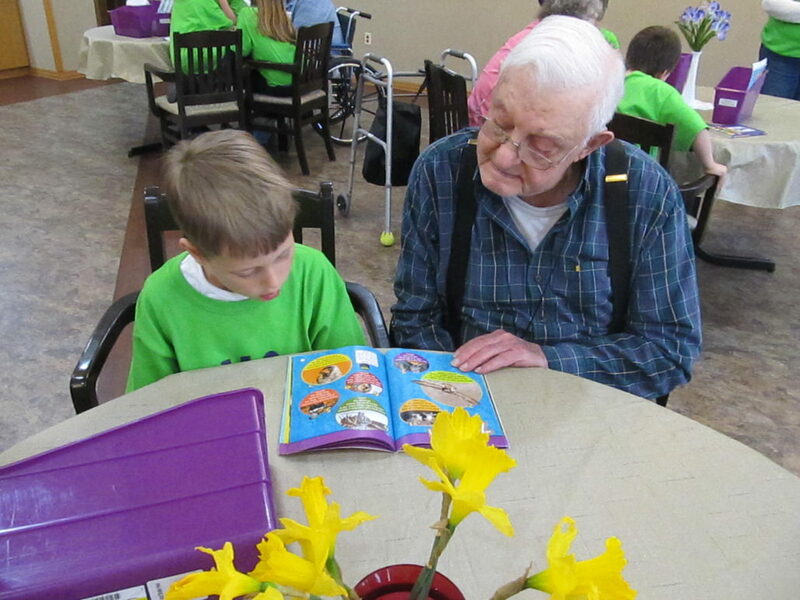 Bradley was among a cafeteria room full of Augusta Health & Rehabilitation residents who spent part of Friday afternoon listening to second-graders from Augusta Elementary School read books as part of the first Hugs for Humanity event meant to involve students in community activities.